 FM Approvals has been made aware of automatic fire sprinklers found in Turkey bearing a counterfeit FM Approvals mark. FM Approvals has neither tested nor certified this product. The sprinkler bears the marking “TYCO” on the wrench boss and “JOB F5” on the frangible bulb. The identity of the manufacturer is unknown. The product appears to be a nominal K5.6 horizontal sidewall automatic sprinkler, with a white finish. The sprinkler was not produced by Tyco Fire Products and has not been tested by FM Approvals. As such, these automatic sprinklers cannot be relied upon to react to or control a fire. Failure by any of the following mechanisms is possible: failure of the thermal element, orifice leakage, premature or delayed operation, bulb strutting (incomplete fracture), ejection of the deflector, inadequate or excessive discharge rate, corrosive attack, failure to operate, failure to produce an adequate discharge pattern, etc. Of further note is the suspected use of an o-ring type orifice seal, a design which has historically been proven to be unreliable and possibly dangerous. Some o-ring type sprinklers have been subject to recall per the Consumer Product Safety Commission. Figure 1 shows a profile view of the counterfeit sprinkler (left) and an authentic Tyco TY3351 sprinkler in white polyester finish (right), which the characteristics of the counterfeit sprinkler resemble. 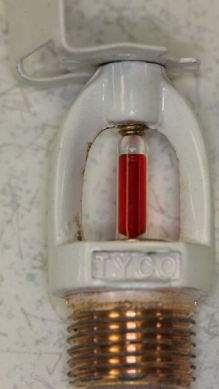 The wrench boss marking reads “TYCO” on both the counterfeit and authentic sprinklers, and both utilize a 5 mm diameter frangible bulb, however, this is where the similarities end. The counterfeit sprinkler frame is a completely different shape in both the wrench boss and frame arms. The wrench boss marking uses raised lettering on the counterfeit sample while the authentic uses sunken letters. 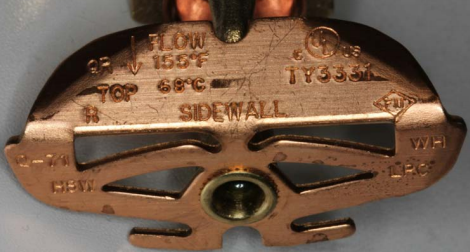 The orifice seal cap used in the authentic sprinkler is a stamped copper piece, while the counterfeit uses machined brass. The deflectors are completely different designs as well. The counterfeit deflector closely resembles a horizontal sidewall deflector design utilized by the Reliable Automatic Sprinkler Co. Figure 2 shows the marking printed on the side of the frangible glass bulb of the counterfeit sprinkler. The marking reads “JOB F5.” It is unknown whether the bulb was manufactured by Job GmbH or is also counterfeit. 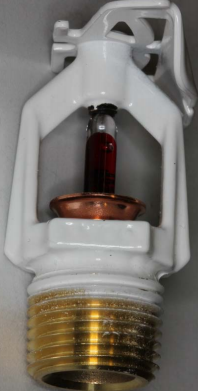 Regardless of the bulb’s origin, no FM Approved sprinklers utilize the model “F5” bulb. Any FM Approved sprinkler utilizing a Job 5 mm bulb will have the “G5” model designation. Figure 3 shows a close view of the inlet threads. The threads are not machined to the NPT standard and have a very slight taper, if any. 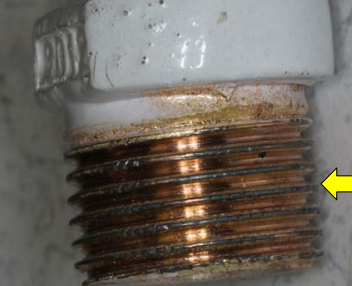 It appears that the brass/copper finish on the inlet threads is a coating or plating, and the base metal does not appear to be a copper based alloy. Also of note is the poor quality of white finish, with numerous air bubbles, more characteristic of air dried paint than a powder coated, heat cured polyester finish utilized in the authentic product (see Figure 1). 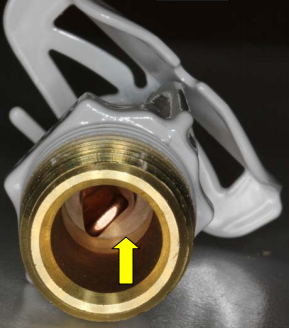 Figure 4 shows a view of the waterway inlets of the counterfeit sprinkler (left) and an authentic Tyco TY3351 (right). The differences in the bottom of the counterfeit machined orifice cap and the stamped authentic cap are evident. Also of note is the visibility of the PTFE coated spring washer orifice seal on the authentic sprinkler (indicated by the yellow arrow). There is no such orifice seal on the counterfeit version. The counterfeit has not been disassembled, but its seal resembles sprinklers employing a silicone o-ring design, which has an extensive history of problems including leakage and non operation. 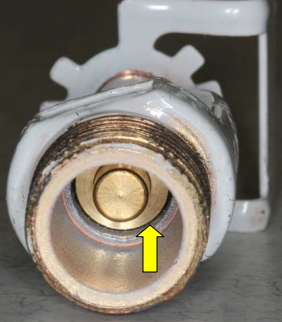 Figure 5 shows the deflector of the counterfeit sprinkler. The markings are difficult to read because of the white finish, but the stamping indicated by the yellow arrow can clearly be identified as a representation of the FM Approvals marking. 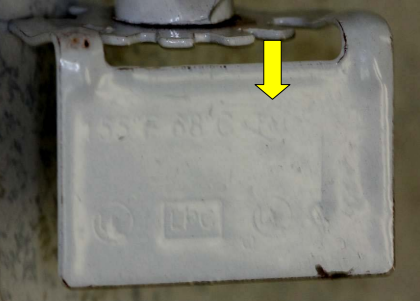 Figure 6 shows the markings on the deflector of an authentic Tyco TY3351. A sprinkler with a plain brass finish was chosen since the markings are easily legible. Authentic TY3351 sprinklers in polyester have identical markings but are not as easily legible due to the thickness of the finish. Figure 7 shows the design of the counterfeit sprinkler deflector. The design is completely different from the deflector used on authentic TY3351 sprinklers. The counterfeit deflector closely resembles one used by the Reliable Automatic Sprinkler Co. 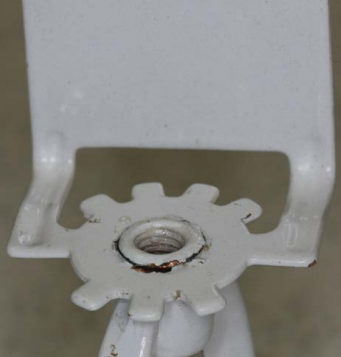 In various places (around the deflector boss and deflector edges, for example) the white finish has chipped or worn off, indicating a poor finish bond. Electrostatically applied powdered resins, such as those used for authentic TY3351 sprinklers, are less susceptible to bonding problems.